Running in Florence, Italy. 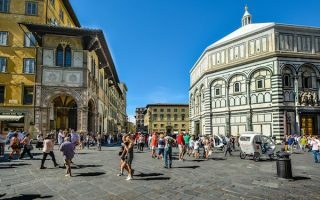 Best routes and places to run in Florence. 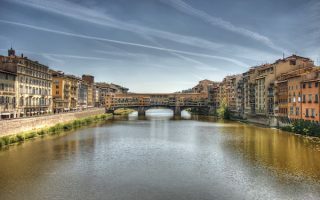 Birthplace of the Renaissance, Florence is the capital of Tuscany and a very popular tourist destination. The beautiful buildings, piazzas, historic bridges across the Arno river, gardens, and hillside setting make Florence a treat to visit. This all makes running in Florence very tempting. The big issue is crowds — if running in the historic center, we recommend going before 8am. One special note for runners: Florence is recognized as a world fashion capital, so bring your nicest running clothes (or buy some there!). We’ve put together several great places to run in Florence, including a couple of historic ‘runseeing’ tours. Another highlight is the run up to the Piazzale Michelangelo. 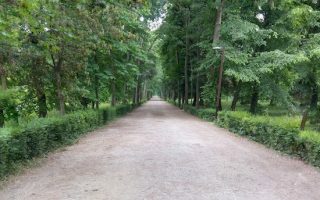 The tree-lined streets and paths of the Arno River, which flows east-west and divides Florence into the historic center to the north and the hillier, less crowded Oltrarno to the south, are a treat when not too crowded, and 3.5 km long Cascine Park is the largest green area in Florence. 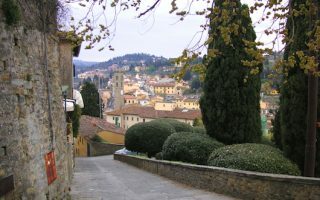 For a quick escape from crowded Florence, the hilly run to the Etruscan town of Fiesole is a treat. We’ve also put together a guide to some other running highlights in Tuscany — see below. Getting around Florence is quite easy. There are buses and an expanding tram/light rail system. A spectacular running experience, especially if you go early. Central section has wonderful tree-lined walkways with great views from the bridges. Further west and east sections have gravel paths. We've mapped 15 km along the river. This defines 'run with a view'. You'll be rewarded with the hilly run up to the Piazzale with great views. A wonderful 7.7 km loop is to run up Viale Michelangelo, then down using Viale Galileo Galilei/Via di San Leonardo. A 'runseeing' tour of Florence. GO EARLY. This won't be fun after 8am. 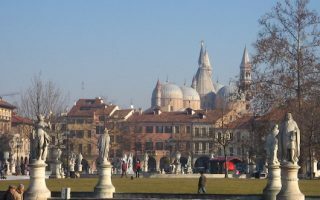 Our 10 km tour starts near the Duomo and includes many of this Renaissance city's highlights. Longer run includes Piazzale Michelangelo, shorter run saves 3.5 km. 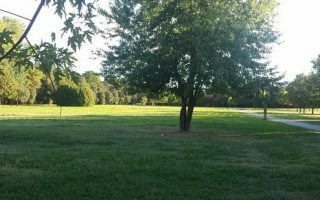 Just north of Florence in the Sesto area, create your own run in several small, pleasant parks: Villa Solara, Villa dei Marchesi Gerini, and Oliveta. Do a run through Sesto. Or combine the Asmana Wellness Center and Villa Montalvo And Ragnaia Park. The 7 km hilly run to the Etruscan town Fiesole is in the steps of E.M. Forster's book, 'A Room with a View'. Some streets are narrow. Can run one way and take transport back. 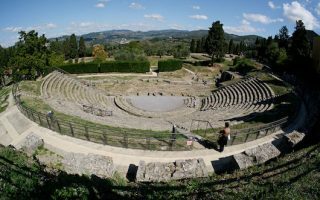 We've also put together a couple of routes in Fiesole. Near Florence, this Etruscan town offers a respite from the crowds, wonderful quiet road, and an opportunity to sample the Tuscan hills. We've created a 6 km Fiesole Highlights run, and a 15 km loop to the hillside town of Settignano. 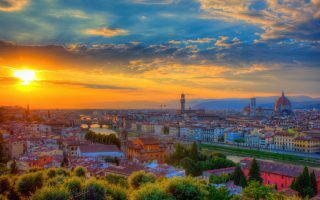 The nearby towns of Pistoia and Prato are often part of a Florence itinerary. In Pistoia, run in Villoni Puccini, a lovely city park with ~3 km of paths. In Prato, nice path along the river, the Parco di Galceti, and hill running in Natural Protected Area of Monteferrato. Florence has hot summers and cool to mild, damp winters. Average high temperatures in summer are near 32C (90F), although nights dip to 16C (low 60s). In winter, high temperatures average 10C (50F), and lows are just above freezing. Summers are fairly dry and most of the rainfall occurs in winter. It can snow occasionally. 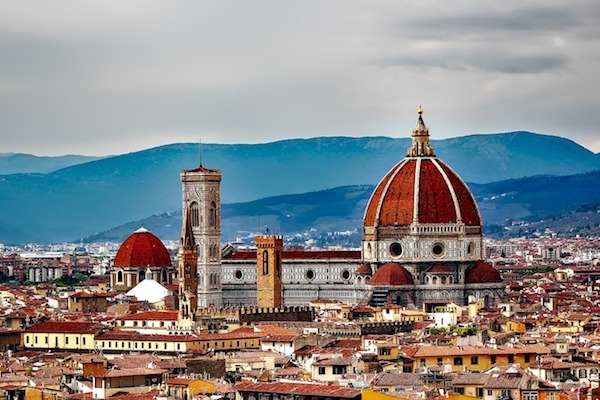 Florence is a very popular destination for visitors. For access to the best running, try to stay near the Arno River, which has paths and also is centrally located for other runs. On the south side of the river, near Piazzale Michaelangelo and the Pritti Palace, is also good running. If staying somewhere central, best to run early to beat the crowds. iRun is the main independent running store in Florence. There are also outlets for Asics, New Balance, and Puma on the outskirts. The best bet for group running is Firenze Corre, which has lots going on and does group runs throughout the year.